There is a guy at church that delivers bread. Every once in a while, for whatever reason, a large load of bread shows up in the church kitchen, free for the taking. Today was one of those days. It just figures that Mickey had just bought two loaves of my favorite Arnold wheat yesterday. (We don't like bread that's been frozen.) The kids weren't shy. 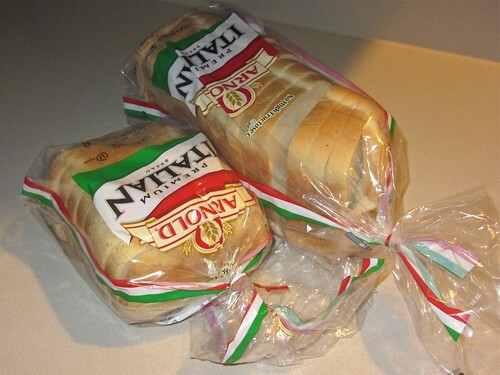 They took two loaves of their favorite bread. As you can see they started eating it on the way home. This afternoon we got to finally meet Baby Benjamin. My brother and sister-in-law came by to show him off. Ben was not very excited, or the least bit happy for that matter, to meet us. He fussed pretty much the entire time he was here. I'm sure that he was just hungry and probably ready to go home since he'd been out for a while. I'm sure next time we see him he'll be a little happier. I did take a couple pictures of him but they didn't turn out very well. Not that Ben would want to make his first appearance on the blog upset.